After booking his flight to Caticlan via Cebu Pacific last December, Tutubi, being a stranger to Boracay since it's not on top of his list on desired places to visit, asked his friends and officemates for cheap accommodations in Boracay and one of the names that cropped up was Boracay Courtyard Beach Resort owned by the same people behind La Carmela de Boracay Resort Hotel in Boracay's station 2 and said to be walking distance from Boracay's Talipapa (public market) for cheap seafood. "Opened only in October 2003, the Boracay Courtyard Beach Resort is the Boracay destination of choice of travel agencies because it offers the best alternative for the budget-conscious vacationer. It is centrally located at Station 2—within a minute’s walk to the beach or to the talipapa (wet market). Boracay Courtyard also offers special package rates for seminar and convention participants." Inquiries at the resort, handled by the same people, same telephone number as La Carmela de Boracay needed to be called, using precious mobile phone calls, twice after inquiries sent via the published email address were not answered and text messages got no replies. Payment had to be done via a bank deposit to La Carmela's bank account at Allied Bank consisting 50% of all charges as advanced payment with the remaining balance to be paid a few days before check-in time. Fax of bank deposit slip and emailed to La Carmela to be handled by their account officer, who Tutubi will call B, were not answered nor acknowledged. Another mobile phone call to La Carmela at 8pm got an answer that Tutubi had to call again the following morning since reservation was closed for the night. Another call was made and was able to speak with B who informed Tutubi he'll check the payment. The remaining balance of the reservation was deposited at Allied Bank with the deposit slip faxed and emailed again to La Carmela's email address. As expected, no receipt confirmation nor acknowledgment was received. Tutubi just decided not to call again so as not to waste mobile air time and instead bring the original deposit slip to Boracay just to be sure. Rooms: the semi-deluxe rooms have 2 double beds that can accommodate 4 persons, with a cost of P2,200/night, cost per head is just P550/pax. They change beddings, pillows, towels every other day. TV and Cable: a 21' color TV requires refundable deposit if you want the remote control. Cable TV, though not high on Tutubi's list, TV is useable for only a few channels-- snowy pictures save for a few. Food: breakfast, served at La Carmela de Boracay, was bland and nothing to be desired that even most "Jollijeeps" in Makati can whip up more delectable dishes. Recommend eating someplace else like the nearby turo-turo for affordable breakfast meals or at Talipapa to save on costs. On check-out, the final payment made needed to be confirmed again with B and with Allied Bank that caused unnecessary delay, as if he did not do his job of confirming the deposit a few days before Tutubi checked in. Tutubi had a blast in Boracay all in all except for his disappointing stay at a cheap Boracay resort called Boracay Courtyard. If you're thinking of checking the place out, Tutubi only has these words for you: you've been warned! The owner of La Carmela de Boracay should really do something about their budget resort's pathetic service. oh what a disappointment!! i'm glad you enjoyed your stay nevertheless. 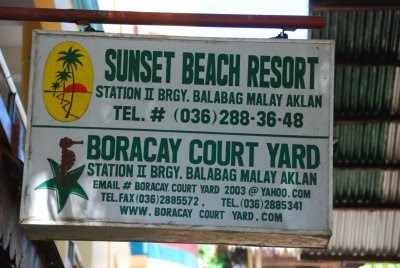 i remembered one time we went to boracay, a decade ago i think and we book a cottage for 300 pesos (beach front)!!! imagine for 3 people and we were so happy with the service. my canadian friend can't believe how cheap and good it was at all. well those days are gone. thanks to this. very good feedback. i hope that you were able to talk to the management or best yet its owner on this. kakahiya kasi pag nangyari din sa iba. the dong, management should be proactive here since it's their line of business. thanks for the feedback. i'm bout to book accommodation there. but now,i have a second thought... thanks it really helps. nyerks... i was suppose to change my booking from la carmela to boracay courtyard, buti na lang i got to read your review... thanks! I must agree their service is very pathetic. I was coordinating with Brendo Rentillo from reservation that boy should not be a front liner given his customer service skills. Very poor and disappointing. I made a reservation for July 29-31 stay for this year (2011). We had a lot of correspondence because he never gave me concise answer for every queries I've made and I have to probe more in order for me to get answers plus the fact that it took them sometimes before they responded to my online reservation through their website. He first email me Feb 25 and I gave him a specific date of our stay. He required me to make a deposit of 50% from the total billing to be made on or before March 4 otherwise it will be cancelled. I asked Brendo if I could extend it to March 15 since I am currently on vacation and will be back within that week and that's the only time I could accommodate such transactions but he refused to grant my request by saying " We would like to inform that we cannot hold the booking reservation on that long period of time. lapsed on given option date, reservation is automatically canceled / released"
My god! may malaking deperensya b kung march 4 at march 15 e july p nmn ang stay namin plus low season yun para isecure nya agad. Sobrang disappointing sila. Ang tagal na nila mag response via text, email etc. tapos gusto nila mabilis ang pag dedeposit. Sobra to! eto n yta pinaka worst na resort na naencounter ko. Grabe! Is La Carmela a better hotel than Boracay Courtyard or is it the same? i've stayed in sunset beach resort last march 2010, malinis naman yung room and un cr. medyo dissappointed lang sa water nila sa cr medyo may di magandang amoy or gnun tlaga sa ibang resort? Haha! This is what I'm telling to my sister, yang hotel kasi (La Carmela de Boracay) ung nirerecommend nya sa pagstay namin sa Boracay this summer 2013. Then search and read alot of negative feedbacks regarding this hotel, including their breakfast at ung welcome drink nila na powdered juice lang...ehehehe. Pero if i'm not mistaken ppag sa boracay courtyard ka, pwede ka gumamit ng amenities sa La Carmela, like pools? I dunno lang if until now, un kasi ung nabasa ko sa isang blogger.